You'll find no mention of David Bowie in Space Oddity. What you will find is a surprisingly fun Space Invaders/Galaga style game. There's nothing extremely innovative about the mechanics, but some of the game's details make it entertaining. 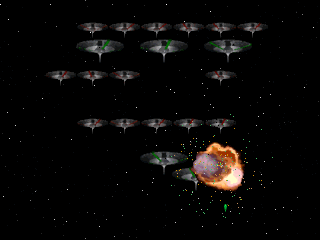 Space Oddity supports one or two (simultaneous) players, and the basic idea of the game is to destroy everything on the top of the screen from your station on the bottom. There are also other types of levels that have you shooting targets and navigating corridors. You collect powerups dropped by a religious-themed Foxivorous. Although the very catchy War of the Worlds background music is what immediately caught my attention, the graphics are also very nice. The ships are 3D renders, and both the realistic and fireworks-like explosions work well. Even if you think you're tired of this type of game, you may want to give Space Oddity a chance. Nobody has shared their opinion about Space Oddity yet. Be the first. Recommendations: The 14 people who like Space Oddity also like the following games. This game is really cool! Graphics, Music, Effects - this has got to be the best Game Maker Space Invaders clone ever - and I usually hate clones. Although you can only play it so many times because you are forced to restart the entire game every time you try again... and I really was annoyed by the exploding blue powerup... But VERY VERY good game. Don't think I think it wasn't good, because I am just critical and picky. Anyone would like to play this at least for five minutes, and most for much longer than that. i couldnt pass through the red boss thing. nice grapfix though. This game ownz! It rulz! It rockz! Far better than 3105. Owns. Period. This is game is CLASSIC! My friend introduced it to me, and I loved it. This so far, is my favorite game made by other users. How many people have played a great game called War Of The Worlds??? Nice music. Next to 3105 this is one of the best shooters ever! This was one of my favourite games! !